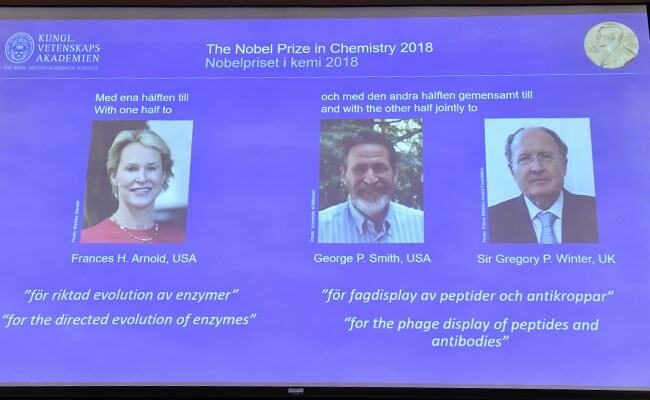 Nobel Prize Chemistry: Frances Arnold won one half of the nine million Swedish kronor (about $1.01 million or 870,000 euros) prize, while Smith and Winter shared the other half. US scientists Frances Arnold and George Smith and British researcher Gregory Winter won the Nobel Chemistry Prize on Wednesday for applying the principles of evolution to develop enzymes used to make everything from biofuels to pharmaceuticals, the jury said. Arnold, just the fifth woman to win the Nobel Chemistry Prize, won one half of the nine million Swedish kronor (about $1.01 million or 870,000 euros) award, while Smith and Winter shared the other half. "The 2018 Nobel Laureates in Chemistry have taken control of evolution and used it for purposes that bring the greatest benefit to humankind," the Swedish Royal Academy of Sciences said. The trio used the same principles of evolution -- genetic change and selection -- to develop proteins used in a range of fields. "They have applied the principles of Darwin in test tubes. They have used the molecular understanding we have of the evolutionary process and recreated the process in their labs," the head of the Academy's Nobel Chemistry committee, Claes Gustafsson, told reporters. "They have been able to make evolution many 1000s of times faster and redirect it to create new proteins." 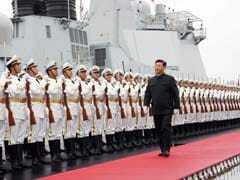 Arnold, 62, is a professor of chemical engineering at the California Institute of Technology. Her work has made it possible to solve problems such as replacing toxic chemicals like fossil fuels. Her method of creating new proteins with desired properties is being used to convert renewable resources like sugar cane into biofuels, and to make more environmentally friendly chemical substances, improving everyday products such as laundry and dishwashing detergents to enhance their performance in cold temperatures. Smith, of the University of Missouri, and Winter, 67, of the MRC Laboratory of Molecular Biology at Cambridge, meanwhile developed an "elegant method" known as phage display, where a bacteriophage -- a virus that infects bacteria -- can be used to evolve new proteins, the jury said. Pharmaceuticals for rheumatoid arthritis, psoriasis and inflammatory bowel diseases have resulted from their research, as well as anti-bodies that can neutralise toxins, counteract autoimmune diseases and cure metastatic cancer.